I'm VERY excited to share this fact-rich post with all of you on one of my favorite topics: rayon! It took me a while to learn about rayon and what it is exactly, not to mention caring for it, because it's so rare in clothing nowadays. In this first month of starting fresh in 2015, I've been preparing for the year's sewing projects, and I've needed to think about fabrics for each of these. I'm sure this post from this month's sponsor, Snowma of Time Capsule Fabrics, will be hugely helpful to you if you're considering a rayon for your own projects and immensely eye-opening if it hasn't been on your radar before! Hi everyone! I'm Snowma and I'm half the team behind Time Capsule Fabrics, an online fabric store catering to the vintage sewing community. I want to thank Emileigh for hosting this sponsored Q&A. 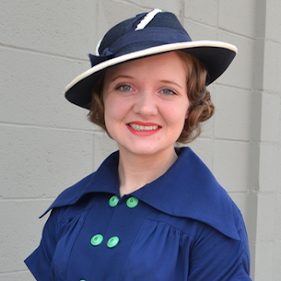 Our store is chock full of hard to find apparel fabrics like challis, lawns and crepes. 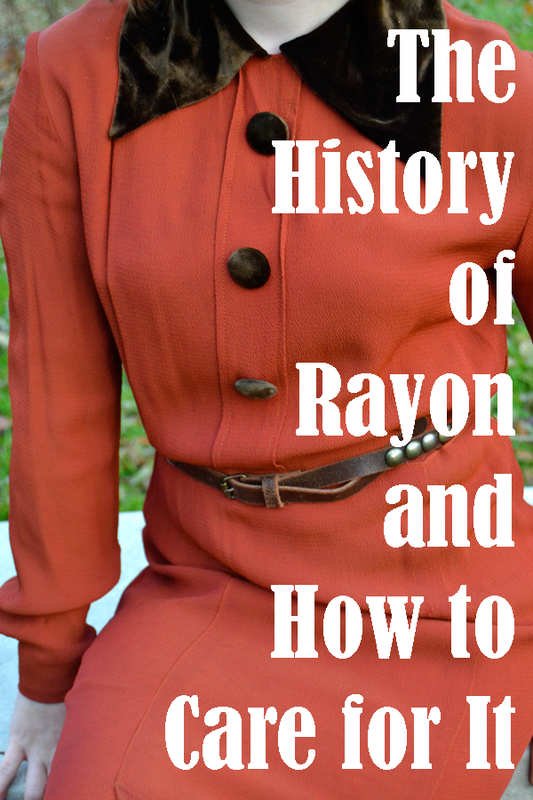 One of my favorite fabrics is rayon, and because it's become tricky to find and many modern sewists are less familiar with it I want to share some of the reasons I love it. Rayon is prized first and foremost for its drapability. It mimics silk. Unlike polyester, it breathes, is absorbent and holds body heat. 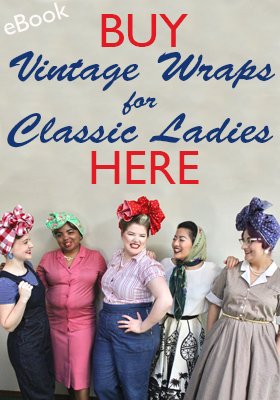 In my opinion it's got it all, and more seamstresses should make it a go-to fabric. Are there special care considerations when sewing with rayon? Rayon is a pleasure to work with but there are some things to keep in mind. Dry cleaning is always appropriate, but as I prefer laundering at home, here are some guidelines. In all my years wearing and sewing rayon, I have never had a problem machine washing rayon on cold. Never wash on warm or hot as rayon can shrink significantly. Because it's weakened when wet, choose a gentle cycle if your rayon is especially delicate. Line dry instead of putting it in the dryer. Use a warm iron and press the wrong side of the garment to avoid scorching. Rayon can sometimes ravel easily so using fusible interfacing or stay stitching when sewing can be useful. Why is rayon harder to find these days? Read the back of a pattern envelope from the 30's or 40's and it's clear that the modern seamstress has fewer options than her earlier counterpart. Fabric types that were once common like dimity, pongee and bengaline have disappeared from the shelves of fabric stores. 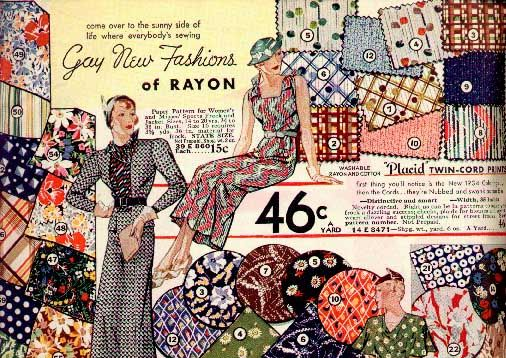 Rayon, while not extinct as a fabric, is becoming harder for seamstresses to find. I attribute this to two factors, the shift by fabric stores to focus on quilters and the increased acceptance of synthetics like polyester and nylon. In LA's wholesale fabric district, shopkeeper after shopkeeper told me how common rayon once was and how hard it is to find now. Undaunted, I managed to score some beautiful solids and prints for the store in my favorite fiber! 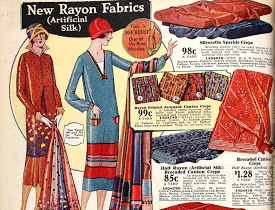 As more of us take up the once common practice of sewing our own clothing, I'm really optimistic that the fabric industry will respond with more diverse apparel fabrics and that rayon will see a comeback. This is Emileigh again. Man, do you want some rayon or what?! I sure do! 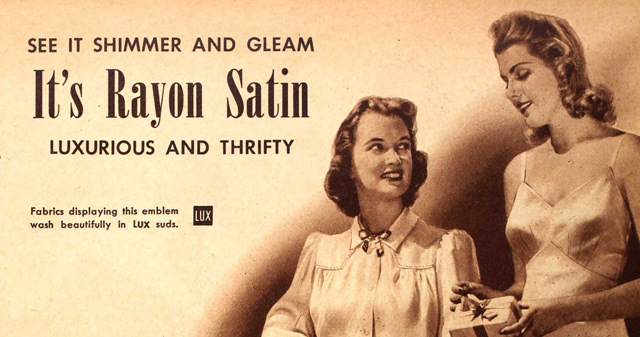 I wish I could get my hands on some of that rayon satin in the ad above... I reviewed a couple kinds of rayon Time Capsule Fabrics offered, so if you'd like a good rayon source I can highly recommend Snowma's shop! This was really interesting and informative. 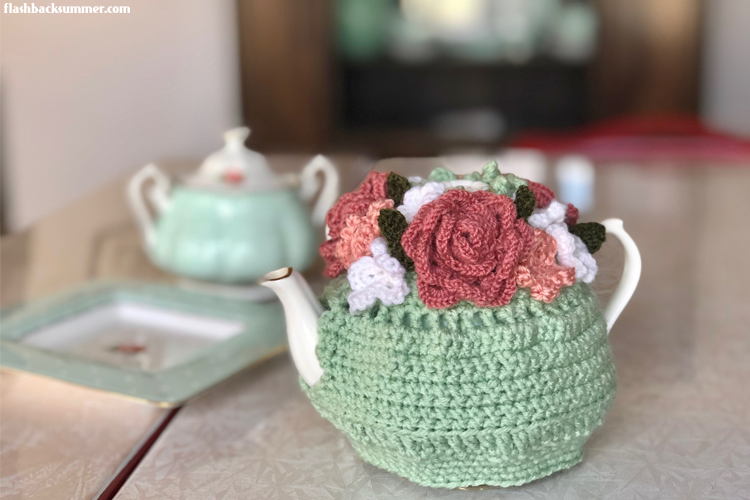 I've gotten really interested in vintage textiles recently, and it really is unfortunate that so many great fabrics have fallen out of common usage now. I'm just learning to sew, but I would definitely love to get my hands on some rayon when my skills are up to snuff. 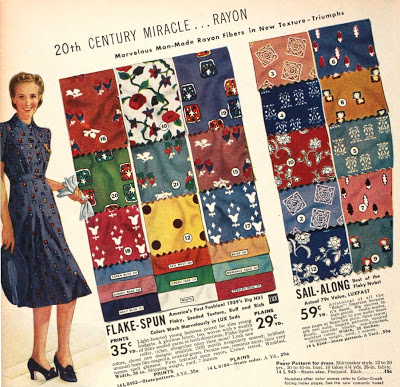 I was just thinking about investing in more rayon fabrics and then I read this post. I agree, it is harder to find it, but it is worth the search. Very interesting post. I'm looking to delve into rayon this year. I know that rayon crepe is a bear to take of but cold rayon and the slinky rayon are much easier. Hoping to make a blouse this year with rayon. What exactly is cold rayon? Wow this was really interesting! I never knew rayon was made from wood. The tips on how to care for it were great too. That's always helpful for someone who thrifts vintage clothing! I know I already posted, but a dress that I had purchased made of rayon taffeta just arrived, and there are several places where the fabric is falling apart a little bit, basically. I know I can't use iron on patches to help reinforce it, but would a patch with fabric glue work? It's my first rayon dress, and it's a beautiful piece from the 30s, so I'd hate to really mess it up trying to save it. From what I've tried, if it's not possible to mend it by sewing, I would try a really thin interfacing ironed on the back. If it's a tear and not a hole, the interfacing won't show through; it'll just hold the pieces together. Remember to iron on a lower heat for the rayon!